White turnips are members of the rutabaga family. They are white with purplish tops and have bright green rough textured leaves. Turnip leaves or “greens” are edible as well as the tops. These root veggies they may look boring but you will find that their taste is anything but that. White turnips have a sweet peppery taste and their firm white flesh has a delicate, mild flavour that tastes like a crisp radish and a tart apple. 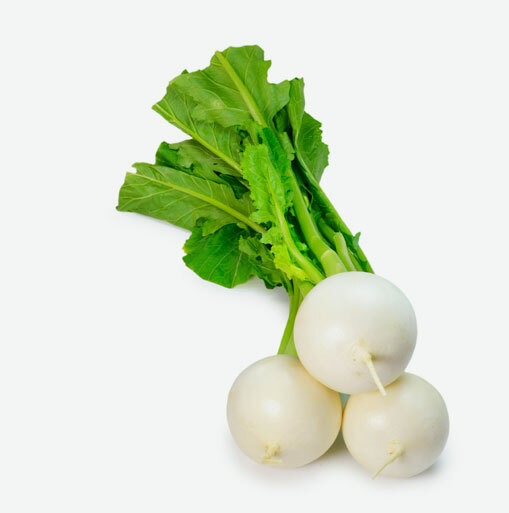 White turnips are rich in vitamins and minerals. They are a great source of complex carbohydrates and very low in calories. Turnips provide dietary fiber that helps to maintain regularity and minerals such as calcium, potassium and folic acid. The leaves, called turnip tops or turnip greens, are an excellent source of B-complex vitamins, magnesium and they are very high in vitamin A and vitamin C. The nutrients that turnips provide are important in the overall maintenance of good health. Choose turnips that are hard and have a smooth skin. Avoid ones with bruises, gashes or mold. To store the turnip leaves or “greens”, wash and shake them dry; place them in a plastic bag and you can refrigerate them for up to two days. To store turnips, place them in a plastic bag and refrigerate them for up to two weeks. Try steaming white turnips and serve them as a side dish with a little bit of melted butter drizzled on them and a sprinkle of sea salt and freshly ground black pepper. If you want something that makes your taste buds sing, add peeled, cored and quartered apples with turnips; boil or steam until tender; mash together; season as desired. Sprinkle with nutmeg and you have a delicious vegetable/fruit combo. Add turnips to soups, stews and casseroles. You can also bake white turnips by simply peeling them and arranging them in a shallow baking dish; dot with butter, sprinkle with sea salt, water and freshly ground pepper. Cover; bake at 350 F until tender. Raw or cooked, add fresh leaves to soups, casseroles, salads. The greens give foods a tangy kick. Place damp leaves in a tightly covered pot with one or two inches of water; cook five to ten minutes until tender but not mushy. Season with butter, salt and pepper; top with Parmesan cheese.